Imagine bringing the best of Victorian-era masculinity to the 21st century while also creating local jobs and protecting the environment. Luke Webster’s The Grooming Network (TGN) has accomplished all of these since starting up in 2011. Along with his wife and two business partners, Webster has cornered the market in old-fashioned wet shaving. Webster started with a single product, a website and a small marketing budget. Within a short time, they had over $40,000 in orders and Webster knew they had connected with real need. 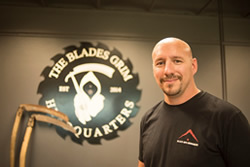 Webster and his team at TGN resurrected the lost art form of creating quality, American-made straight razors by patenting a unique process for manufacturing the blades in North Idaho. These reusable razors help reduce landfill shave waste by 96% while saving customers money. Webster credits his business clarity to working with the North Idaho SBDC. Together, they identified a path forward to create a three-fold increase in his business in the next five years. Webster is on a mission to change the way the world shaves. For more about The Grooming Network, visit TheGroomingNetwork.com, and for more about the Idaho SBDC, visit IdahoSBDC.org. To find an SBDC near you, go to americassbdc.org/home/find-your-sbdc/.